In 1915, Sergey Prokofiev (1891–1953) went abroad for the first time and heard Diaghilev and Stravinsky disparage opera as an outmoded form, destined to be superseded by the ballet. This was only one year after the premiere of Stravinsky’s Le Rossignol. The effect of their then-fashionable strictures, paradoxically, was to instill in the young Prokofiev a mission to revitalize opera. Cleofonte Campanini, then director of the Chicago Grand Opera (who had wanted to produce Prokofiev’s The Gambler but was unable to obtain the materials from St. Petersburg), commissioned the composer to produce a new work. The composer, settling in New York City following the revolution, went to work on the opera Love for Three Oranges early in 1919 and delivered the completed score on 1 October. After a two-year delay, the opera, conducted by the composer, was produced in Chicago on 30 December 1921 as L’Amour des trois oranges, the French translation by the composer and Vera Janacopoulos. Love for Three Oranges, op. 33, consists of a prologue and four acts, with a libretto by the composer after Carlo Gozzi’s L’amore delle tre melarance (1761), adapted (1913) by Vsevolod Meyerhold, Vladimir Solov’yov, and Konstantin Vogak. 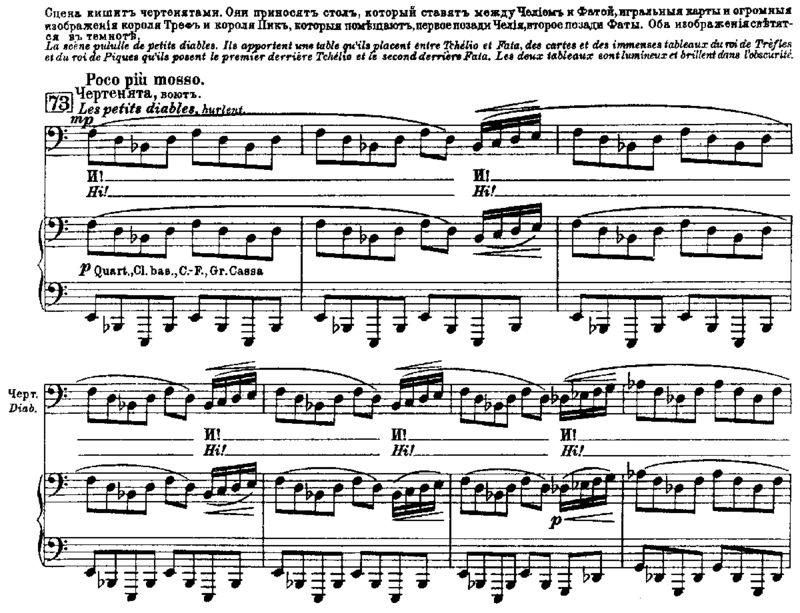 In act 1, scene 2, Prokofiev includes a wordless chorus. Before this scene begins, a curtain covered with cabbalistic symbols drops, leaving only a small part of the stage for the action.1 The characters Celio and Fata Morgana—playing for the King of Clubs, and his enemy Leander, the King of Spades, respectively—engage in three rounds of cards, Celio losing all of them. Each time the cards are shuffled, the male chorus, indicated in the score as “Les petits diables, hurlent” [“Little devils, howling”], sing a wordless exclamation. Such a scene, with devils running about, seems reminiscent of Weber’s “Wolf’s Glen” scene from Der Freischütz, or the “Chasse royale” from Berlioz’s Les Troyens, the vocalizations contributing to the overall dramatic effect.